Quiet & Peaceful Luxury Beachfront Condo - Awesome Sunsets! Boat Dock Included! This Non-Smoking, spacious, 3 bedroom, 2 bath condo is completely renovated! This is NOT your average beach place! Leather couches, Tommy Bahama furniture, new top of the line pillow top mattresses, 3 TVs (1 is a large screen HDTV), brand new cabinetry in the kitchen & baths, new tile flooring. The building has only 10 units. It’s a peaceful, quiet part of the beach. Mostly residential. It’s surrounded by huge Estate Homes. The sunrise is absolutely beautiful coming up over the Inter-coastal Waterway w/a great view from the master bedroom in the morning. There’s a boat dock available directly across the street from the unit. The sunsets are more than breathtaking! What a view from the balcony! It’s truly a wonderfully relaxing, quiet place to spend time. Enjoy the convenience of a trolley that takes you up & down Gulf Boulevard. There are many fine restaurants & activities that are within walking distance to the condo. PLEASE NOTE THIS IA A MINIMUM 7 DAY RENTAL AND NO SWIMMING POOL! The Ultimate Vacation Awaits You! : The ultimate vacation awaits you. 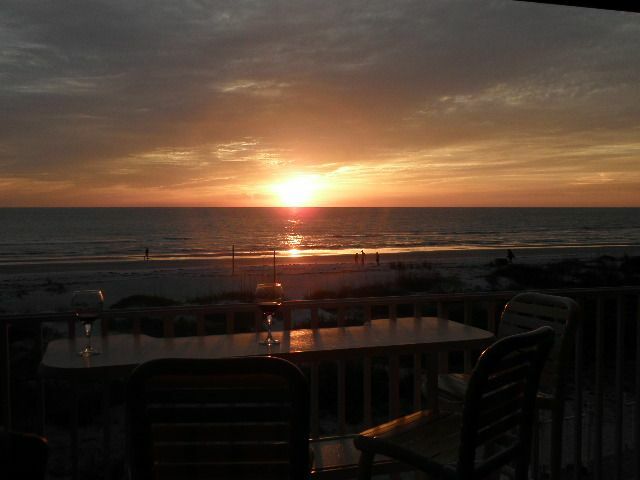 Awesome sunsets over the Gulf of Mexico from the large living room balcony. Beautiful sunrises over the intercoastal waters of Boca Ciega Bay from the master suite. Award winning beach rated among one of the safest in Florida. Boating and fishing from your own dock. Fine & fun restaurants within walking distance. Interior Features for a Wonderful Getaway! : Stylistly furnished in Tommy Bahama furniture. Consistently rated among one of the best in the nation. One of the nicest white beaches claimed as one of the safest. Plus the bonus of one few units that is also on the intercoastal. The best of both worlds. Also have a dock on the intercoastal.